The "Palace and Archaeological Site of Knossos" project, intended both to deal with the various problems faced by the monument and to promote it, was included in the 3rd Community Support Fund (CSF) in 2000, to be implemented by the Archaeological Receipts Fund. 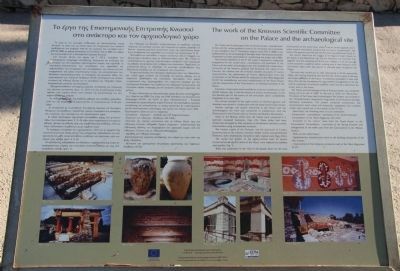 The Knossos Scientific Committee has been responsible for coordinating the project since 2001. The Technical Bulletins of the 3rd CSF project comprised an integrated programme for the conservation, consolidation and promotion of the Palace and the wider archaeological site. This included the conservation-restoration of the masonry, gypsum and limestone, the copies of the frescoes, the columns and the imitation wooden structures of Evan's reconstruction; the replacement of Evan's lightly-arched roofs; the conservation of the Minoan pithoi; the restoration of the "West Magazines III-VII"; the consolidation and static reinforcement of the "South House"; and the conservation of the "Caravanserai", an outlying monument of the Palace. Close-up view, that is displayed on the marker, of photographs, that are identified on the marker as being figures 1-10, showing the various restoration projects of the archaeological park. 1) and the masonry of Evan's reconstruction, as this has become part of the history of the restoration and is considered a monument in its own right. The serious problem of the rapid erosion of sensitive gypsum and limestone was solved in collaboration with the Stone Conservation Centre. Ancient coatings and plaster preserved in the Palace and the archaeological site were also conserved, in collaboration with the Directorate for the Conservation of Ancient and Modern Monuments. Some of the Minoan pithoi from the Palace were conserved in a specially equipped laboratory (figure 2, 3). These pithoi had been extensively damaged by their exposure to the elements and due to earlier interventions using incompatible materials. The famous copies of the frescoes, and the paintwork of Evan's reconstruction on the columns, imitation "timber frames" and architectural members, were aesthetically restored to their original state (figures 4,5,6). The rusted iron girders of the lightly-arched roofs of Evan's reconstruction in specific areas of the Palace were replaced by stainless steel girders (figure 7). View of the marker situated on the archaeological park's entrance walkway, looking towards the admission gate. on the gypsum was relieved and the pillar was reinforced (figure 8, 9). The visitors' route from the "Loggia of the Figure-of-Eight Shields" to the "Room of the Olive Press" (figure 10) was improved and extended. This, together with the cordoning off of the area, helped to limit the damage to the monument caused by visitors walking over it. New bilingual visitor information signs were also placed in selected spots throughout the Palace. The work was carried out by staff specialising in all the appropriate fields, who, having identified and recorded the various types of damage and major problems of the Palace, immediately proceeded to deal with them. This laid the foundations for the scientific management of the site and the acquisition of technical expertise, which will be a benchmark for similar work in the future. 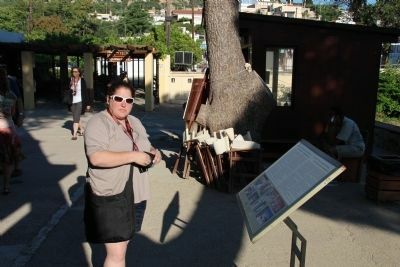 The "Palace and Archaeological Site of Knossos" project was completed during the first half of 2009. At the end of 2010, the "Restoration - Promotion of the Palace and Archaeological Site" project was included in the "Competitiveness" Operational Programme of the National Strategic Reference Framework. This project comprises conservation and reconstruction work which will essentially supplement and complete earlier work carried out in the context of the 3rd CSF. View of the marker situated on the archaeological park's entrance walkway, looking towards the restored ruins of the palace..
- Extension of the visitors' route from the "South House" to the "Caravanserai", Consolidation - restoration of the "Spring Chamber" and configuration of the wider area from the "Caravanserai" to the "Minoan Viaduct". - Improvement of the temporary protective roof of the "West Magazines III-VII. Location. 35° 17.892′ N, 25° 9.694′ E. Marker is in Knosos, Crete, in Heraklion. Marker can be reached from Dedalou south of Glafkou, on the left when traveling south. Touch for map. 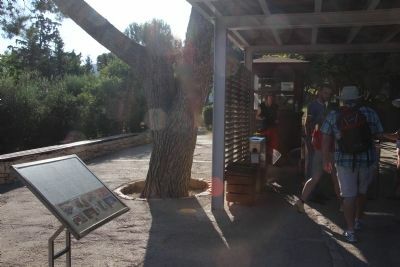 This marker is located on the island of Crete, just south of the capital city of Heraklion, in the Palace of Knossos archaeological park, and you must be walking on the grounds of the archaeological park in oder to see this marker (this marker being the first one that you would see once you pass through the entrance gate). Marker is in this post office area: Knosos, Crete 714 09, Greece. Touch for directions. Other nearby markers. At least 8 other markers are within walking distance of this marker. Palace of Knossos (within shouting distance of this marker); "Kouloures" (within shouting distance of this marker); Conservation - restoration of the "West Magazines" (about 120 meters away, measured in a direct line); West Magazines (about 120 meters away); "Theatral Area", "Royal Road" (about 120 meters away); "Piano Nobile" (about 120 meters away); "North Lustral Basin" (about 150 meters away); "Throne Room" (about 150 meters away). Touch for a list and map of all markers in Knosos. More. Search the internet for The work of the Knossos Scientific Committee on the Palace and the archaeological site. Credits. This page was last revised on June 16, 2016. This page originally submitted on July 16, 2015, by Dale K. Benington of Toledo, Ohio. This page has been viewed 297 times since then and 8 times this year. Photos: 1, 2, 3, 4. submitted on July 16, 2015, by Dale K. Benington of Toledo, Ohio.